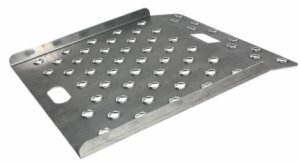 HandTrucksRUs.com > Hand Truck Curb Ramps > Liberator Aluminum Curb Ramp 26" X 18"
Attached handle on underside adds portability and doubles as a support leg. Lightweight, strong, and durable aluminum construction will stand up to years of heavy use. Especially useful for movers or for deliveries that require several trips. This ramp is very sturdy and well designed. I use it for loading equipment into and out of my store with my Rock N Roller hand truck over an 8inch step. My only complaint: The ramp deck has circular holes punched through it. The edges of these holes are flanged upward on the deck, presumably for traction. The result is a ramp deck that is a bit bumpy for carts that have smaller caster wheels. Still an excellent ramp.